Food is such a huge part of our lives. I consider myself a foodie and hold an emotional connection with food. I have many fond memories of kneading bread dough, baking cookies and experimenting in the kitchen as a child. That love of food has stuck with me into my adult years and can even be accredited as one of the contributing factors of attracting my husband. The bottom line is we love food in our house. Now, I have always struggled with my weight. All my life I have been known as a big girl. I didn’t over eat except occasionally, and I always stayed active. I have had so many tests done, thyroid checked, met with a nutritionist, alternative doctor, you name it. I had tried every diet I could think of. The low carb-no-arb diet helped me lose somewhere around 50 pounds. (I was 270+ pounds at 17 years old) Then I gained some back. I felt defeated. I finally had something change inside me and I was able to accept myself. I am the way I am and I need to be happy in my own skin. This was the start of my real health journey. In 2009 I decided to try being gluten free. It took me a year to be almost fully gluten free and I felt so much better. No bloating after I ate and brain fog was gone. I even realized my joints felt better. It’s sometimes true that you don’t know how crappy you feel until you feel better. That sore bloated mess was my normal and by going gluten free I created a new normal for myself. Now I get really sick if I eat gluten. Fast forward to when I found out I was pregnant. That really put my health awareness journey on overdrive. I started learning about the difference of organic versus non-organic foods. I learned about genetically modified organisms (GMOs) what “natural flavor” really is. I learned about growth hormones in dairy products and animals. I learned about the overuse of antibiotics. I learned about how most of these animals are treated unethically. I realized that there was no way I would want my children to deal with the same health issues I had/have to. I want my kids to have the best start in life I can provide for them. I want them to be educated to listen to their own bodies, to eat healthy foods filled with vitamins, minerals, probiotics, antioxidants, protein and good fats. We use supplements (all organic and non-GMO, plant or soil based) but, I know the best place to get the things to nourish our bodies is through the food we eat. We make our own bone broth, cook at home, buy locally whenever it is possible. Where we live at the moment it isn’t possible to grow a garden, so we use our local farmer’s markets and co-op for fresh foods. I have found this resource helps us cut down our spending and not sacrifice the quality of our foods. This company offers whole foods at a discounted cost then I have found anywhere. It is a yearly membership with the first month free. Ships right to your door, and it is free shipping on orders 49$ and more. (Which is not hard to add up to with all the great deals) I usually shop for the whole month at once to qualify for the free shipping, and it takes about a week to get to my house in Vermont all the way from California. You can check it out here. I meal plan for the whole month. I plan for five dinners a week and account for two nights of leftovers. I add in fresh fruit, lunches, snacks and breakfast items. Whether it is my husband’s lunch for work or if I am going to be out and about with the girls, we pack lunches and healthy snacks. Quick and easy lunches for us are chicken salad nori rolls, apple and nut butter “sandwiches”, fruit, salad in a jar, etc. This takes some planning ahead, but it helps cut the cost. For meal inspiration check out my Facebook group Clean Eating on a Budget. We cook at home almost always. I try different recipes every month. I also try to pick my old favorites and substitute for whole foods. Oats, beans, flours, spices, anything you can is usually cheaper when you buy in bulk. We usually source through our local co-op or contact companies directly. If you can find a good farmer you trust, meat is almost always cheaper when you buy in bulk from the locals. Find another family who is willing to go in with you and buy half a cow or even a few families so you can buy a quarter at a time. Usually, they will have some extras for canning and freezing if you offer to pick it yourself or buy in bulk. A good place to start is the local farmer’s markets. It also contributes to the local economy. Have some veggies or fruit going bad? Dehydrate them and you have snacks like carrot chips, dried apple chips, banana chips, and so much more. Kombucha and water kefir are other things you can do at home to cut the costs of buying. Picking your own fruit when they are in season for the rest of the year ad freeze or dehydrate. Get a deep freezer. Whether it is for the meat your buying in bulk, the veggies you blanch and freeze, or the bone broth storage, you will want to invest in a nice deep chest freezer. Canning everything from apple sauce to beans. I utilize my freezer more than I can food, but you can figure out what works best for you. Organic broths can become quite pricey, but they are so easy to make at home. I got some beef bones from a local farmer and made my own. One thing I love being able to do, is using as much of the whole animal as I can. We buy chickens from a farmer and get 2-3 meals from one bird, then use the bones to make broth. This is easily done in a crock pot, on your stove or in a pressure cooker. 10. Buying in season and stocking up when on sale. We like to stock up on canned tomatoes when they are on sale. BPA-free organic canned tomatoes can get pricey, so when they go on sale we stock up. When veggies and fruit are in season they are typically cheaper. Buying extra to store can help save you money in the long run. 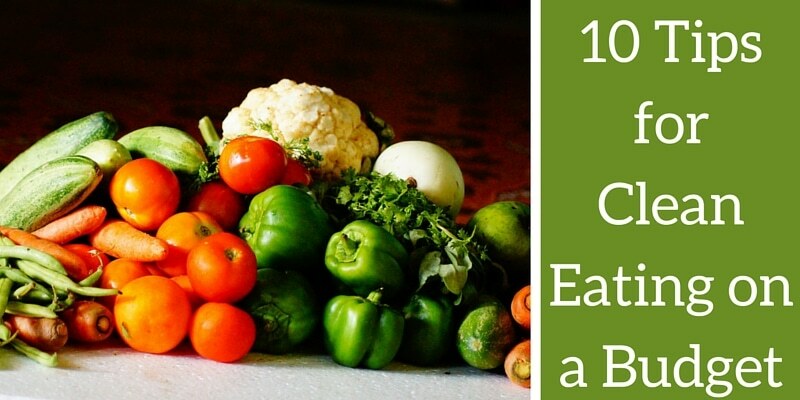 I hope these tips help you save money and enable you to feed your family better.